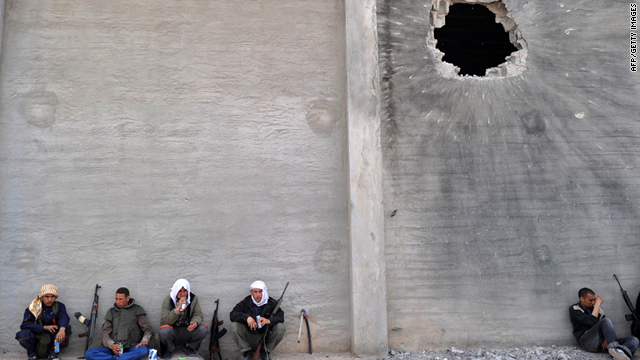 Libyan rebels rest close to a building where pro-Gadhafi forces are reportedly holed up in Misrata on Sunday. Tripoli, Libya (CNN) -- Amid reports that pro-government forces have withdrawn from the besieged Libyan port city of Misrata, at least 16 people were killed and 71 were wounded there Sunday, a doctor at a local hospital said early Monday. An eyewitness said pro-Gadhafi forces randomly and extensively shelled the city Sunday. The witness asked that his name not be used because of fears for his security. "There are explosions every five minutes," the witness said. The doctor, who also asked that his name not be used because of fears for his safety, said NATO fighter jets had begun hitting targets in Misrata early Monday. The witness said he feels safe every time he hears the NATO jets overhead, because whenever they're not present, pro-Gadhafi forces shell the city. Also early Monday, loud explosions and jets were heard in the capital, Tripoli. Anti-aircraft fire was both seen and heard. A banner on Libyan state television cited a military source saying that the "crusaders' airstrikes" were targeting both civilian and military targets, resulting in casualties and damage. Earlier, a source in Misrata described clashes with remnants of pro-government forces. The source declined to be named because of fear of reprisal. A Libyan government spokesman explained the army came under rebel attack as it withdrew from Misrata, and so the army simply fought back as it continued withdrawing. "Our army will always attack back if it is attacked," said the spokesman, Musa Ibrahim. "We cannot just ask them to die and not fight back." Ibrahim said the army's withdrawal was continuing. Misrata, a rebel stronghold in western Libya, has been the scene of some of the most prolonged fighting in the current conflict. Rebels "liberated" the main market in the city and the central hospital, the local resident said, but the city remained unsafe and not under complete rebel control. Ibrahim said tribal chiefs are moving to Misrata's outskirts and negotiating peace with the rebels and city inhabitants, but an opposition leader denied those claims. "There are no tribes and there are no negotiations. It's only Libyan people fighting against Gadhafi's forces," said Col. Ahmad Bani, a rebel military spokesman. Ruler Moammar Gadhafi is "lying to say to the world that he's looking to find a solution," Bani said. "These are Gadhafi dreams and they will never happen." The regime had earlier said it was calling on the tribes to deal with the rebels in Misrata, whether by negotiation or force. Ibrahim said the tribes are armed and "prepared to defend their land." He said, "The rebels have two options: either to escape the country and leave Misrata and go somewhere else, or to give up their arms. And as we have promised before, a general pardon will be issued for everyone." The rebels, under the umbrella of the Transitional National Council, received a pledge Sunday from Kuwait for about $180 million. The announcement came during council chief Mustafa Abdel Jalil's visit to Kuwait, Kuwaiti state-run television reported. Ibrahim responded to that report by questioning why Kuwait was seeking to help one side rather than seeking to resolve the conflict. "We know that some countries are not interested in Libyan peace, democracy, and the future of this country," Ibrahim said. "Why is it that some governments jump on the opportunity to make the Libyan crisis even worse ... instead of helping all parties establish peace?" Hundreds have been killed in the battle for Misrata, under a bloody siege from Gadhafi's forces for seven weeks. It is the scene of some of the deadliest battles of the war as the rebels attempt to oust Gadhafi, who has been in power for 42 years. Human Rights Watch has said Gadhafi was using internationally banned cluster bombs and other lethal munitions indiscriminately to kill civilians. The United States conducted its first Predator drone airstrikes Saturday afternoon, Pentagon spokesman Navy Capt. Darryn James said. Keeping with U.S. practice not to comment on drone strikes, the Pentagon offered no other information. CNN's Kamal Ghattas, Kareem Khadder, Hamdi Alkshali, Reza Sayah, Saad Abedine, Frederik Pleitgen and Barbara Starr contributed to this report.